Last Wednesday, the Demon Deacons took on Virginia Tech at home, but struggled to overtake the Hokies the entire game, losing 83-75. With some students returning to Winston-Salem early from winter break, the Lawrence V. Joel Veterans Coliseum was full of energy last Wednesday, Jan. 10. Early in the first half, Virginia Tech established a strong lead. Although the Deacons were only able to decrease the point deficit to five points in the middle of the first half, sophomore guard Brandon Childress had a standout performance. With 17 total points, four rebounds and two steals, Childress’s efforts were not enough to put Wake Forest over the hump. Along with Childress, Doral Moore led the team defensively with 13 rebounds. Moore also contributed with 12 points and two steals. This also turned out to be a successful performance by junior guard Keyshawn Woods, who finished with 12 points going 5-9 from the field coming off the bench. Junior Bryant Crawford put up 10 points, four assists and five defensive rebounds. Despite the loss, the Demon Deacons outperformed the Hokies defensively with 40 rebounds compared to Virginia Tech’s 30 and 13 turnovers total. Although this is an exciting statistic for the Deacons, it was not enough to dominate the Hokies. With five minutes to go in the second half, Wake Forest was able to get the score within four points, but failed to close the gap. Last Saturday, Jan. 13, the Demon Deacons travelled 85 miles straight East to face Duke in a classic ACC matchup. The Deacons could not out-score or out-rebound the Blue Devils to get over the hump in the second half. 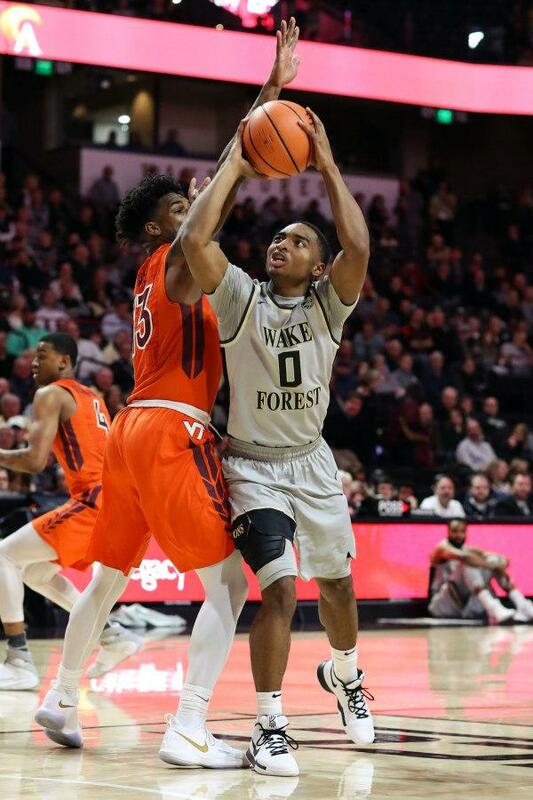 Overcoming a tough week at home and away, Wake Forest Men’s’ Basketball takes on the NC State Wolfpack in Raleigh this Thursday at 8 p.m.
On Sunday, the Deacons play ACC leader,Virginia on Sunday in the Lawrence V. Joel Veterans Coliseum at 6 p.m. Looking ahead, the Deacons hope to snap out of their current three-game losing streak as they continue ACC play this month.